We like to know how things work. We like to invent, modify and improve technologies like any other hacker. We do it without the aim of money. As hackers we do it for knowledge and to satisfy our curiosity, and we decided to use it in a way to build a better world. Most of us also were rebels in school, and probably got in trouble a few times. We grew up and saw the system as the enemy. We were welcomed into regular hacker groups but we thought they had a limited political education and were still parroting the system's propaganda. The rest of the hackers we knew thought we were crazy joining street protests and reading Bakunin, de Cleyre, Marsh and other political theorists. While we were in the Seattle, Genoa, Berlin, Athens, and Toronto revolts already learning who is the real enemy of liberty & freedom, we noticed it is not just the government, but capitalism, church, race, gender, nationalism, imperialism, patriarchy, etc that are our enemies. With time we became the first hacktivists and formed hacker collectives of anarchist values like consensus making, direct democracy, horizontal organization, mass collaboration, stigmatic or federated and or decentralized decision making models. We wrote security tools, guides, data storms with the aim of helping dissenters all over the world and those trapped within the same State borders and structures. We thought that it was not enough so we created online fronts of hacktivists, some of which are still growing today, and participated in their actions. We also found a lack of political experience with the new comers so we decided to put some aim in education and work on a critical mindset. We are tired of being victims without a fight, we are tired of having skills without putting them to good use, and for us good use is not to work for you and your dogs. Now that we have evolved we are the insurgency. You are afraid of us. You use your state and corporate media to invent more propaganda to terrorize our comrades all over the world, lying about freedom fighters, making us look like the enemy, impotent, or lost but this time it¢s different. This time we are legion. Our barricades are not just in electronic form, and be assured that we have more skills than any of your "for-profit" dogs you may have persuaded to work for you. Even now some of us work for you and then against you. We do not send information to your media dogs about our actions, we keep them to ourselves, you know who we are, you know we are less than willing to rule by celebrity and this is what scares you. We are serious in taking your system down brick by brick and byte by byte from the inside and the outside and we have succeeded so far. All your bases are belong to us. And to all of those begging for liberation, liberate yourselves. A dog that begs will never be free of its master. Information must be free and those who own the information and control the access to it have the power and so we must decentralize that power and free the data! 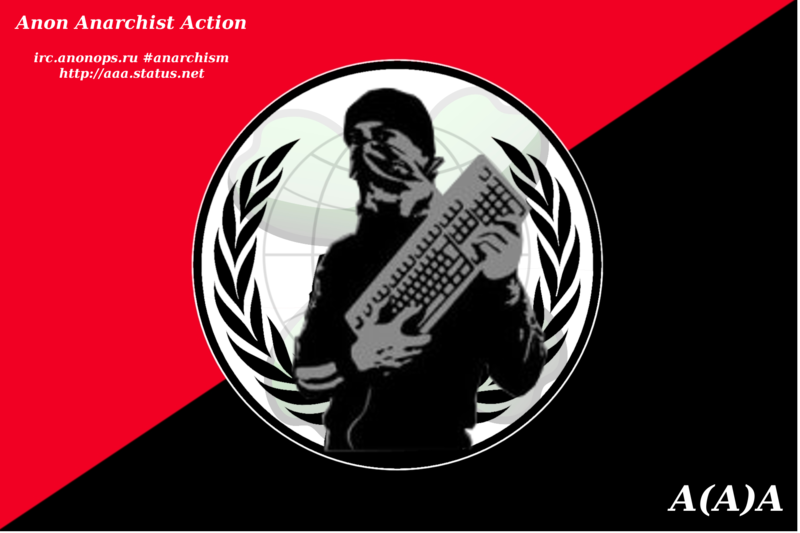 We envision all digital forms of resistance, and use them to show the world that we can win many battles and more, for this we decided not to divide our self from our anarchist comrades but join everyone, we do not conform on just one front, and encourage all fronts. We take people to the streets and bring to the electronic world activists that could not have done so before increasing our numbers! Diversity of Tactics and Diversity of fronts! We believe every individual who, in the current state of affairs, preaches on the ballot box to choose an authority is wasting time & inflating a horrible capitalist system, we'd rather contribute towards a new world with a spirit based on anarchist values & mass collaboration. For this most of us believe in a diversity of strategies and autonomy, not just working in the shadows of the internet darknets but also in the streets and communities with other insurgents of all sorts. Our insurgency uses a diverse array of actions depending on what each of us decide is necessary and are capable of at that moment and time, all working on what we do best. We fight oppression in any form. And of course, we hack. a(A)a Anon Anarchist Action, YourAnonCentral and other members of Anonymous and other collectives that rather be kept hidden participated in the creation of this manifesto that in no means is yet finished.